Kirovohrad Academic Ukrainian Music and Drama Theater (Кіровоградський академічний український музично-драматичний театр ім. М. Кропивницького; Kirovohradskyi akademichnyi ukrainskyi muzychno-dramatychnyi teatr im. M. Kropyvnytskoho). 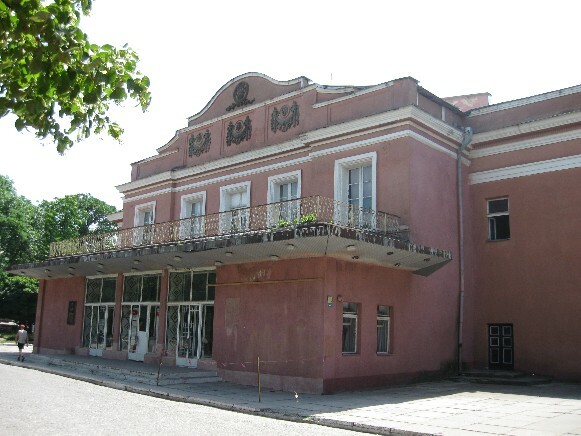 Founded in 1938 as an oblast workers' and collective-farm theater in Oleksandriia, it was evacuated during the Second Wold War and then relocated to Kirovohrad (now Kropyvnytskyi). It is located in the building of the former Winter Theater where productions of the first professional Ukrainian theater troupe led by Marko Kropyvnytsky had once been staged. Over the years its repertoire included Ukrainian and world classics such as Kropyvnytsky's Dai sertsiu voliu, zavede v nevoliu (Give the Heart Freedom and It Will Lead You into Slavery) and Zamuleni dzherela (The Silted Springs), Mykhailo Starytsky's Talan (Destiny), Lope de Vega's Fuente ovejuna, and William Shakespeare's King Lear, as well as Soviet Ukrainian plays such as Yurii Yanovsky's Duma pro Brytanku (Duma about Brytanka), Oleksii Kolomiiets's Dykyi anhel (The Wild Angel), and Mykola Kulish's Otak zahynuv Huska (Thus Huska Perished) and, finally, contemporary Ukrainian plays, such as Mykhailo Barsky's Koly rozluchaiut’sia dvoie (When Two People Part). Its stage directors have included Hryhorii Volovyk, Ivan Kaznadii, Mykhailo Hiliarovsky, Mykhailo Barsky, Valerii Deinekin, and Mykhailo Illiashenko.